This post's Tune comes from Courtney Love. As a moody teenager I was one of those kids who loved grunge, although I did still wash so I didn't really embrace the whole ethos of it. Despite being slightly out of time in getting into the whole thing, I was totally obsessed with the likes of Nirvana, Alice in Chains, Soundgarden and Hole. Now as time went on and obviously these amazing bands were no longer around Courtney Love emerged as a solo artist. She may not always be miss popular but you can't dispute that shes a hell of a lady and as far as I'm concerned has an amazing voice. You can watch the video here, and have a little look at the website here. So this is my latest outfit, I think it's kind of my way of easing myself into the cold cold winter... Stick a parka on but refuse to give up the dress without tights! Oh yeah, summer power. Don't know how long I will keep this up though, as soon as it gets a bit more cold I'll be reaching for the thick black tights. This dress is a new addition which I received for my birthday. I love it, it's simple but the colour is just so bold it doesn't really need much else, sometimes keeping it plain and simple is the way to go. 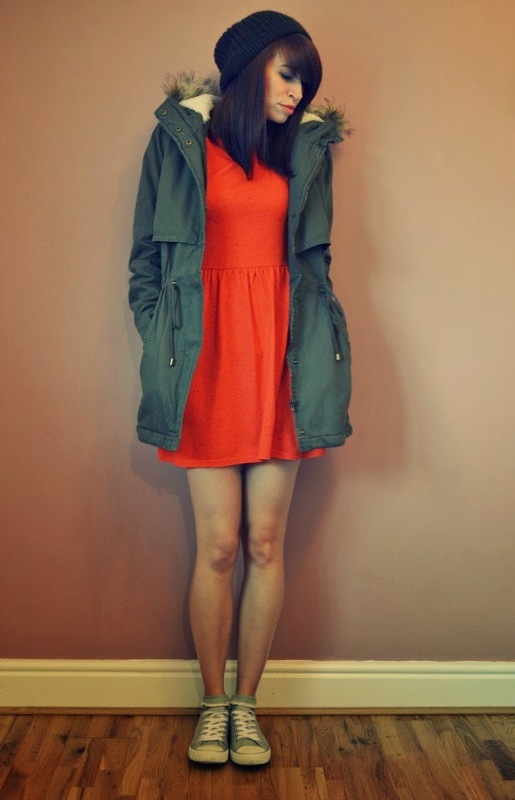 I do think that the orange goes just perfect with the green of the parka. My parka by the way was something I really wanted for winter and was prepared to pay quite a bit for one, however, when I saw this one in Matalan for just £35.00, I was absolutely sold. Plus it has the softest fleece lining and fits just perfectly. I finished off the look with my converse style daps, my old topshop beanie and my very well used satchel from good old Camden Market. Last week was a funny old one, it has more downs than ups and sometimes there is something which happens which puts everything into perspective. You ever feel like it's always one thing on top of another? Hope you've all had an amazing weekend. I love this dress ♥ You look beautiful in it. Great look! I love the jacket with the dress! Really cute outfit Helen. I love the color and the jacket. Your tennis and socks look so cute! Great outfit. Love the dress, the colour looks so good on you! Such a cute outfit - you're right, perfect for the transition from summer to autumn. Ha, I was so a grungy teenager, but couldn't go through with not washing! 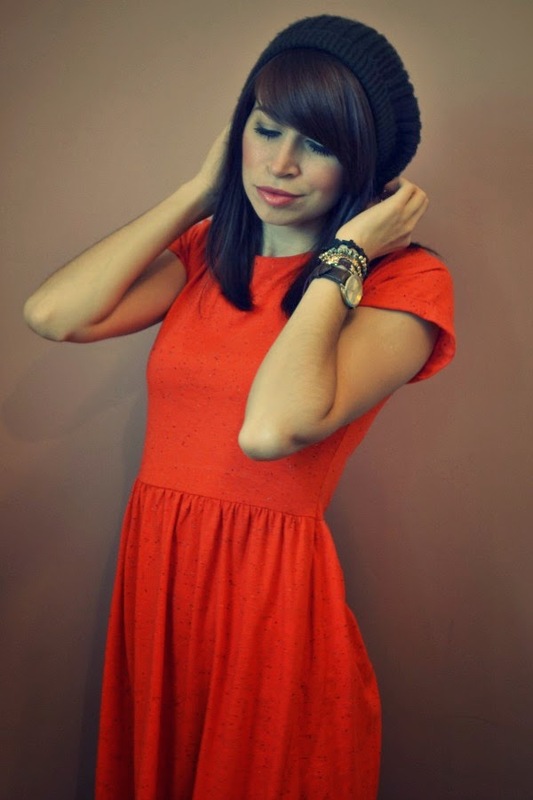 I am in love with the orange dress, I need more orange in my wardrobe! Beanies have now become my favorite item to wear. Love this vivid orange dress! you look so pretty! You have really great blog and I followed you on bloglovin #251, hope u follow back to keep in touch. This look is so good! Love the colors! love this orange color on you! Such a cute outfit for everyday! Want your bag and your jacket :) Would you like to follow each other on GFC and bloglovin? Let me know - love your blog! 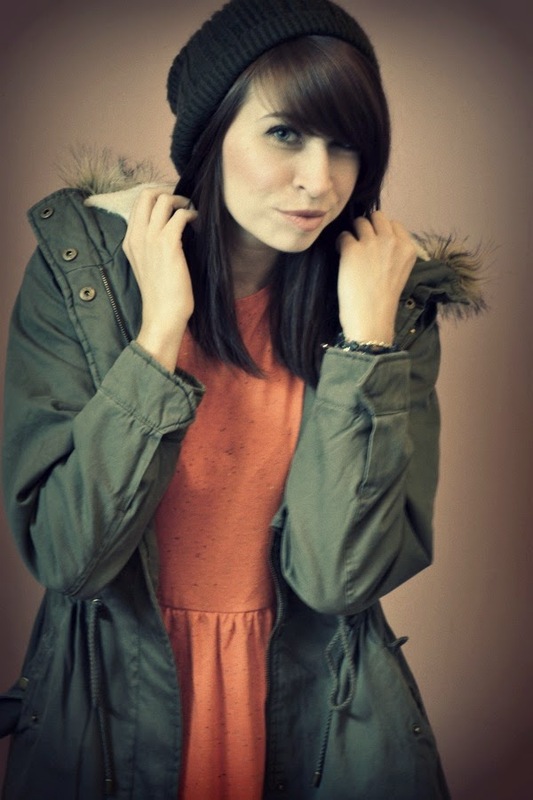 Love this outfit, spesh the beanie, my fav accessory! I was much the same as you loved Nivana and Alice in Chains, have to admit I never got into Hole though! I really like your jacket; it's perfect for Fall!